So, you have your account on Twitch, and you would like to know how to use a screen share feature to increase your audience? No worries, nothing hard and here you will find all the info that will make your broadcast superb! 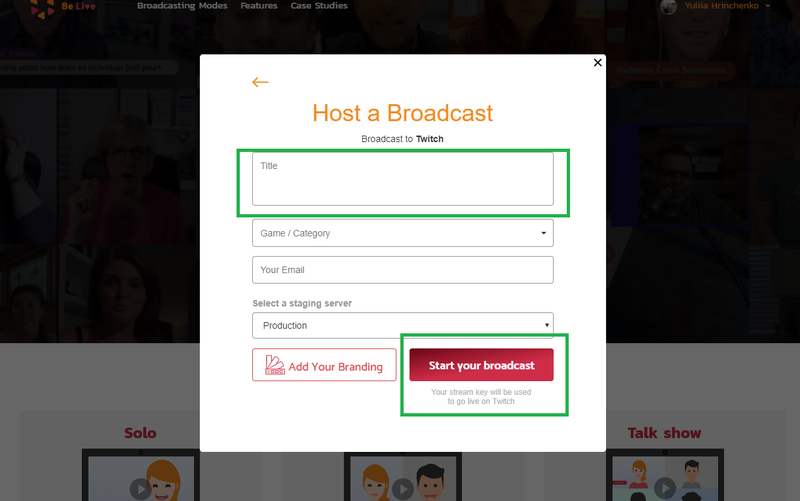 Go to https://belive.tv/ and press "Start Broadcasting"
You may want to choose the Category for your broadcast. Just start typing, and you will be able to select the right category in the dropdown menu. Time for "Start your broadcast" button! 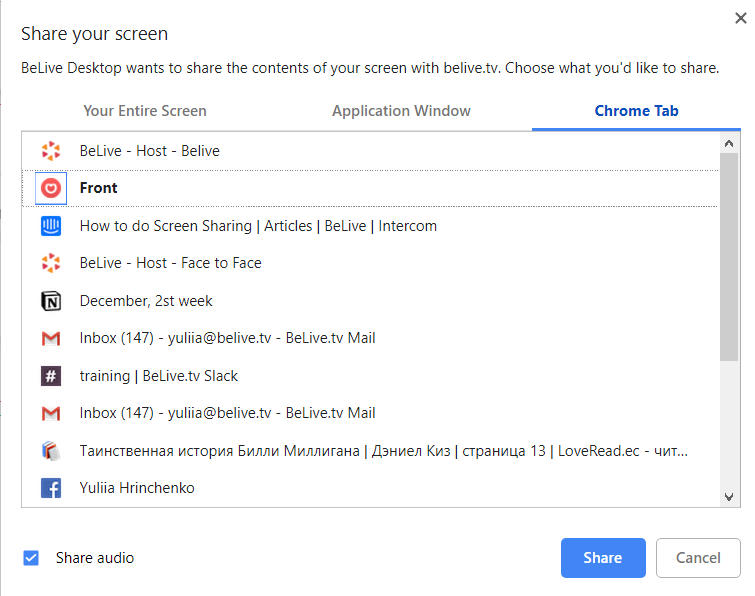 Here you can try screen share feature with all its power! You can select "Your Entire screen" and click on the "Share" button. Or choose the application window you want to share and click on the "Share" button. Or choose the Chrome tab you want to share and click on the "Share" button. For Mac, application window will be available for sharing only if it’s neither opened full screen nor folded to Doc. For Windows users, the application window should not be folded to the taskbar. For Mac users sound will be available when sharing a Chrome Tab. 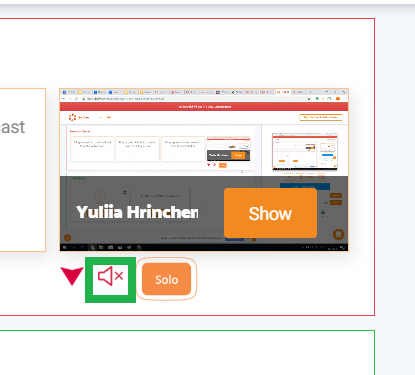 For Windows users sound will be available when sharing Entire Screen or Chrome Tab. You've chosen what you want to share, and it is time to move the window from Lobby to Broadcast section so your viewers could see it. Very easy, just click "To Broadcast". 3. 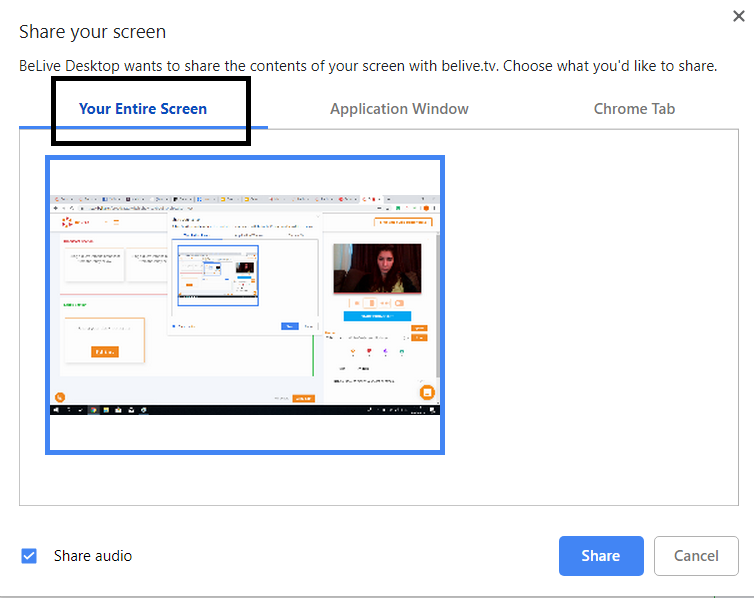 Want an audience to see ONLY your screen sharing window? 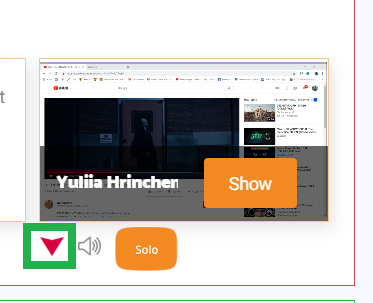 Here is a "Solo" button. 4. Decided to end screen sharing? Click here, and it will be moved back to Lobby Section and become invisible to your viewers. 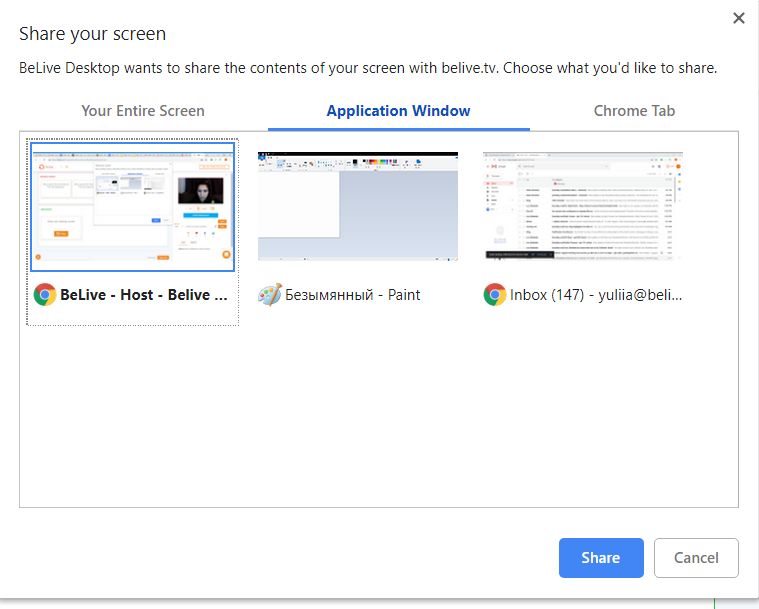 TIP: If you're experiencing any problems with screen sharing, you may want to try reinstalling BeLive extension in Chrome. So, that`s all. Was it hard? Hope no :) Enjoy your broadcast!